Mitsubishi Shipbuilding Co., Ltd., a Group company of Mitsubishi Heavy Industries, Ltd. (MHI) based in Yokohama, held a christening ceremony on March 12th for a liquefied petroleum gas (LPG) carrier currently under construction for JX Ocean Co., Ltd. The new ship, named FUTURE ACE, will be the twelfth of Mitsubishi Shipbuilding’s latest third-generation, 83,000m3-class LPG carriers. In addition to increased energy-efficiency, the ship will have the capability to adapt flexibly to major LPG terminals worldwide, as well as specifications compatible with the new expanded Panama Canal. Completion and delivery is scheduled for the end of March, 2019. The FUTURE ACE has a length of 230m, width of 36.6m, and depth of 21.65m, with a draft of 11.55m. Gross tonnage is 48,167 tons, with a total tank holding capacity of 83,000m3. Launching took place on December 27th, 2018. Construction was managed by Mitsubishi Heavy Industries Marine Structure Co., Ltd., an MHI Group company based in Nagasaki. The name “FUTURE” refers to the “X” (meaning “future”) of the JXTG Group, of which JX Ocean is a part. “ACE” was chosen because A (the first letter of the English alphabet) represents the first of newly constructed LPG carriers that will be part of the planned FUTURE series, and because its association with “first-rate” or “forefront.” Of note, this is the 29th vessel built under contract at Nagasaki Shipyard & Machinery Works for JX Ocean and its predecessor company. 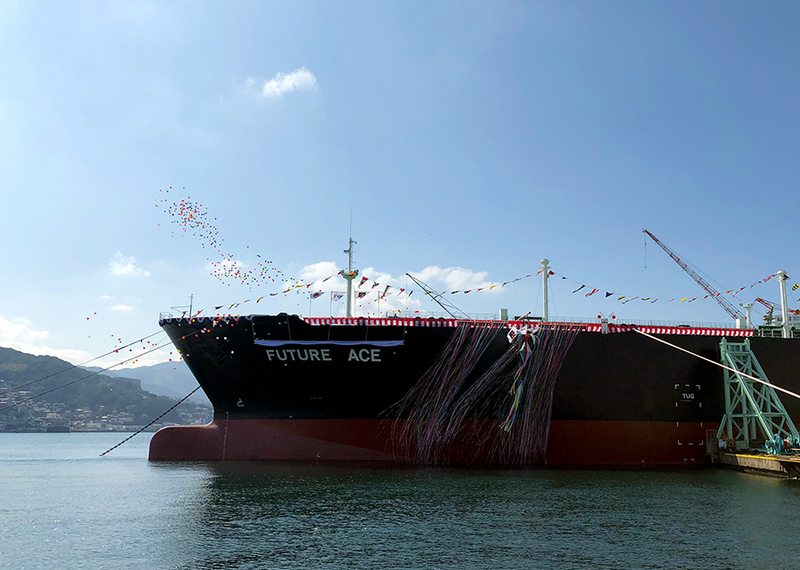 The FUTURE ACE is equipped with a proprietary hull form (developed with the design and manufacturing expertise of MHI Group) that aids in providing exceptional fuel-efficiency and compatibility with the various LPG terminals around the world. Specifically, the vessel utilizes the hull form (optimized with the latest development technologies) and a screw propeller, (combined with the Mitsubishi Reaction Fin) to improve overall propulsion efficiency. The ship is also equipped with the Mitsubishi SOx Scrubber System, which complies with the tighter regulations on marine SOx emissions that will come into effect in 2020. This is the first time Mitsubishi Shipbuilding has utilized this system for a ship built in-house. In a continuous effort to contribute to stable, global energy supplies and environmental conservation, Mitsubishi Shipbuilding and MHI Marine Structure will continue developing and refining fuel-efficient and sustainable LPG carriers.